One of the most beautiful and well-preserved(*1) paintings by Fra Angelico, from any period in his career, is the altarpiece that he painted for the Guidalotti chapel in the church of San Domenico, Perugia. The main panels of this majestic work (fig. 87), now in the Galleria Nazionale dell'Umbria, Perugia, represent the Virgin and Child enthroned with four angels and Saints Dominic, Nicholas, John the Baptist, and Catherine of Alexandria. The chapel in which this altarpiece originally was located(*2) was dedicated to Saint Nicholas of Bari — hence the prominence of that saint, who stands immediately to theVirgin's right in the main register, and whose legend is recounted in seven scenes on the three panels that comprised the predella below it. Shown at left in the first panel (fig. 88) is the miraculous birth of Saint Nicholas in the town of Patera in Greece: according to his legend, on the first day Nicholas was bathed he was able to stand by himself in the washbasin. 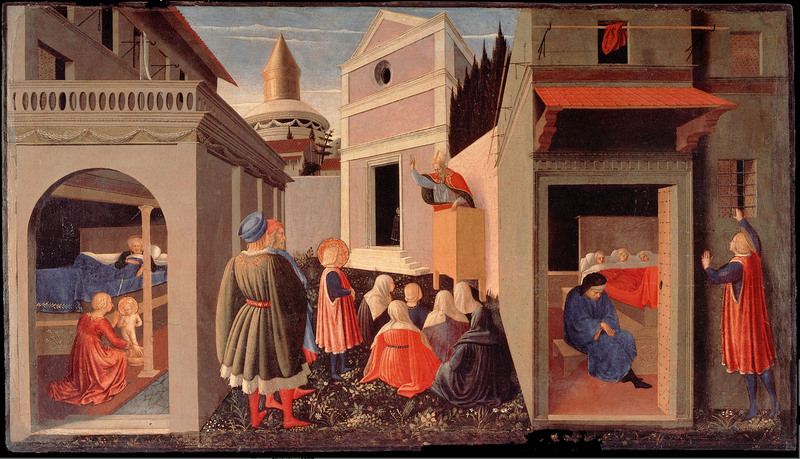 In the scene in the center of the panel the youthful saint ignores the games and vanities of his friends and, instead, listens intently to a bishop preaching in front of a church. At the right is the well-known episode of the charity of Saint Nicholas: hearing of the plight of a poor man who could not arrange for the marriage of his three daughters, as they lacked suitable dowries, Nicholas resolved to save the girls from prostitution by secretly throwing sacks of gold, one for each girl, through the bars of their window at night. From this story, a sack or ball of gold came to be a standard attribute of Saint Nicholas, and Angelico painted three wrapped-and-tied bags of gold at the feet of the saint in the main panel of this altarpiece. 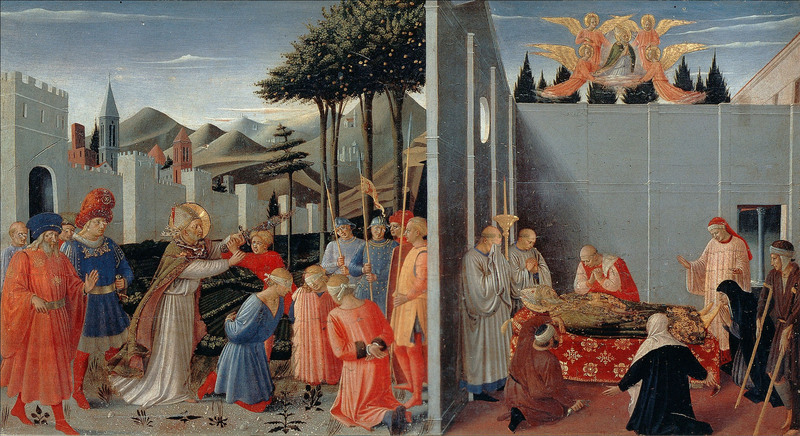 Two further scenes from the legend of Saint Nicholas occur in the second panel of the predella (A), now also separated from the altarpiece and exhibited alongside the first panel in the Pinacoteca Vaticana. Elected Bishop of Myra, Nicholas had quickly become known for his sanctity and charity. 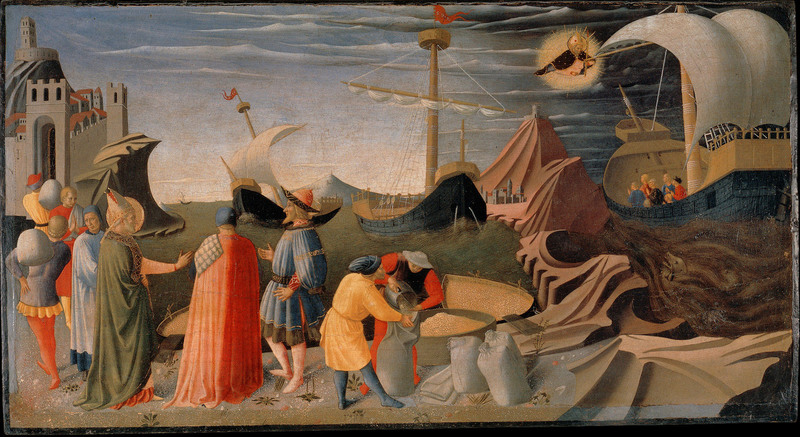 At the right of the panel, a boat full of sailors prays for salvation from a fierce tempest at sea; Nicholas appears to them in a vision, calming the winds and leading their boat to safety. At the left, Nicholas approaches another group of sailors bringing grain for the emperor from Alexandria to Rome. Nicholas pleaded for a ration of one hundred measures of grain to relieve the starvation of his town, which was suffering through a drought, but was told that the grain had been carefully measured and that a full tally had to arrive at the imperial granaries. After Nicholas assured the sailors that sharing their grain would not diminish the emperor's portion, they measured out one hundred sacks to be carried into Myra (on the left). When the ships subsequently reached their destination in Rome, the full tally of grain aboard miraculously was found to be intact. In the final panel of the predella (B) — the only one to remain with its original structure — Saint Nicholas, in the presence of three princes of the Roman Empire, halts the execution of three innocent men condemned to death by a corrupt prefect. At the right in the panel, the death of the saint is portrayed: Nicholas's body is arrayed on a bier covered with a red-and-gold cloth of honor and surrounded by mourning acolytes and pilgrims; above, his soul is borne heavenward by four angels. 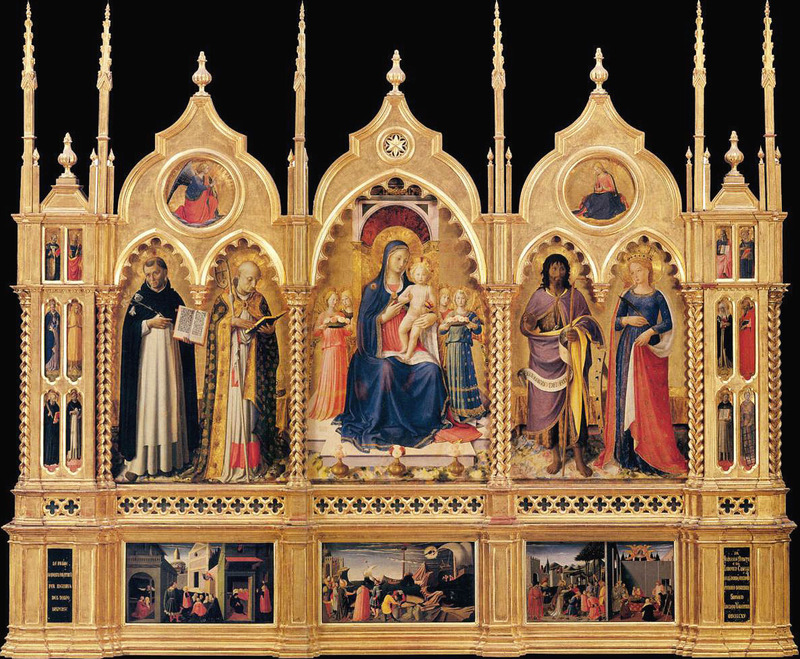 Arranged in a traditional polyptych format with each full-length saint standing before a burnished gold background and beneath an ogival arch — two on either side of the Virgin and angels in the center panel — the overall design of this altarpiece is not significantly different from the high altarpiece from San Domenico in Fiesole (cat. 10), the San Pier Martire triptych (cat. 13), or the Franciscan altarpiece of 1428-29 (cat. 24). In the Guidalotti altarpiece, however, the artist made a significantly more sophisticated effort to create a sense of unified pictorial space than he had in any of those earlier works. In addition to employing the conventional device of a brightly colored marble pavement extending across the foreground, he continued the projecting corners of the dais on which theVirgin's throne rests, from the center panel into the lateral panels, and introduced a low bench draped with a cloth of gold spanning the full width of each lateral panel, behind the saints. The bench serves as a spatial anchor for the entire composition by delimiting the depth of the pavement on either side and placing it in an exactly measurable relationship with the recession of the dais in the center panel. Angelico also exploited the bench as an opportunity to heighten the richness of his painted light effects — specifically, the luminescence of the reflected highlights and shadows delicately stamped and glazed along the pleats of its covering fabric — and to increase the sense of anecdotal veracity otherwise created by the tactile illusionism of the painted draperies, providing a perch for Saint Nicholas's miter, casually propped on top of it rather than at the saint's feet. As a final contravention of the restrictions of the Gothic picture field in which he had (or chose) to work, Angelico painted a shadow cast by the frame of the altarpiece that stretches along the pavement behind the figure of Saint Dominic in the left-hand panel. Completing the painted portion of the altarpiece was the decoration of its original frame. The present frame is a neo-Gothic structure designed and carved for the altarpiece in 1915. Although it has been criticized for the inappropriate arrangement on a single plane of twelve small figures of saints in niche-like spaces that once filled the front and lateral faces of two buttressing pilasters — one at either end of the altarpiece — it is highly plausible in its overall form, following a convention of frame design and carpentry popular in Florence through the 1430s and into the decade of the 1440s. Recent studies of the wood grain of the twelve pilaster saints have established their grouping in four columns of three saints each,(*3) but the arrangement of these columns has not yet been correctly determined. Based on compositional observations — principally, on the orientation of the stance and the direction of each saint's gaze — and, to a lesser extent, on iconographic arguments, it is possible to suggest that the left pilaster contained paintings of Saints John the Evangelist, Benedict, and Mary of Egypt (from top to bottom) on its front face, and of Saints Peter, Costanzo (? ), and Peter Martyr on its outer face, while on the right pilaster were images of Saints Stephen and Lawrence with the Blessed Catherine of Siena (front face) and Saints Paul, erome, and Thomas Aquinas (on the outer face). Finally, the spandrels over the pairs of saints on the lateral panels of the altarpiece were filled by roundels portraying the Annunciatory Angel and theVirgin Annunciate, again following the format of Angelico's earlier San Pier Martire and Franciscan altarpieces. The original frame of the Guidalotti altarpiece appears to have remained intact through its various changes of location within the church of San Domenico until 1812, when it was dismantled for shipment to Rome as part of the Napoleonic secularization of church property and the formation of the Capitoline Museum as a major public monument in the new Kingdom of Italy. (*4) Until that date, references to the altarpiece mention the three predella panels separated from it — one of which was sent to Paris and ultimately returned to Perugia, and the others sent to Rome but never recovered — yet they describe the main panels as a single unit representing the Virgin and Child with angels and saints. In the event, the altarpiece never actually left Perugia; it was retained as the property of a church still used for officiation of the cult, but after 1814 the pilaster saints and the roundels with the Annunciation are specifically referred to as distinct objects. It has not previously been noticed that another fragment must have been excised when the frame was dismantled, one not accounted for in subsequent inventories in Perugia.The central pinnacle of the altarpiece as it is now reconstructed is inappropriately designed to be the same height as the lateral pinnacles, but it originally must have been proportionately taller. Mario Salmi suggested that the decorative medallion that presently occupies its center, or one like it, might originally have contained a painted image, either of God the Father or of the Crucifixion. (*5) Although this proposal has met with little comment in studies of the altarpiece, it is undoubtedly correct. That the center pinnacle was, indeed, once filled with an image of God the Father is indicated by closer observation of the Annunciation roundels in the lateral pinnacles. The Angel Gabriel, in the left roundel, kneels on a bank of clouds holding a palm branch in his left hand;(*6) he gazes directly across at the Virgin and raises his right hand to communicate his message of blessing. The Virgin, in the right roundel, seated humbly on a red cushion with a book open on her lap, places her hands together in prayer but looks neither across at the angel nor down, in modesty; instead, her eyes are directed upward toward the source of grace. Furthermore, she is lit from the left, as is every other figure and scene in the altarpiece except the Annunciatory Angel, on whom the light falls from the right. The only explanation for this anomaly is that the angel is not illuminated by the natural light of the chapel but by the radiance emanating from a figure of God the Father or of the Blessing Redeemer in the missing central roundel. Two independent images of God the Father by Fra Angelico survive that have been excised from Annunciation groups on altarpieces. One of these, somewhat earlier in date than the Guidalotti altarpiece and, in addition, with a Florentine provenance, is now in the collection of H.M. Queen Elizabeth II, on loan to the National Gallery, London; it is discussed in catalogue 25 as part of the proposed reconstruction of the Saint Lucy altarpiece of about 1430. 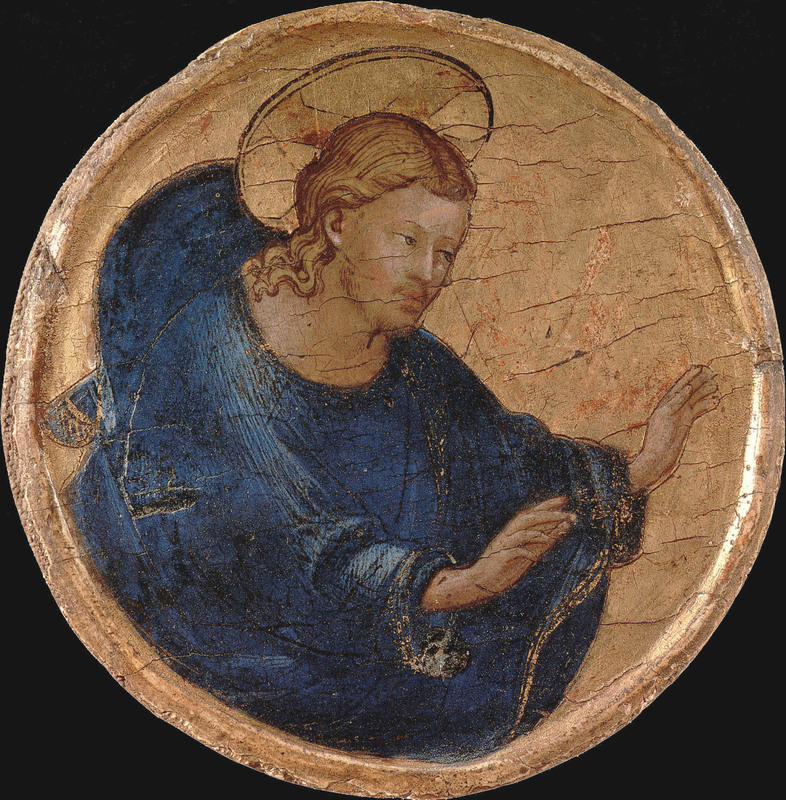 The other (C), a small roundel (12 centimeters in diameter) in the collection of the Fondation de France, on permanent deposit at the Musee du Louvre, is generally regarded as an early work by Fra Angelico,(*7) but the dramatic three-quarter profile view of the figure di sotto in su and the foreshortening of his hands and halo argue, instead, for a date not earlier than the mid-1430s. Considerations of subject and style make this panel an excellent candidate for the missing central pinnacle of the Guidalotti altarpiece. Several further observations may be made in favor of the traditional dating of the Guidalotti altarpiece. Although it is frequently argued that Angelico was constrained by his provincial (Umbrian) patrons, the Dominicans of Perugia, to perpetuate an outdated, Gothic-type polyptych, what physical evidence remains to be gleaned from the disassembled panels of the altarpiece itself suggests that it was probably constructed and painted in Florence. While it is possible nonetheless that Angelico was not free to choose his own format, such an assumption cannot be sustained a priori, and a date in the mid-1430s is not incompatible with the form of the Guidalotti altarpiece. (*11) In addition, it has frequently been contended that Angelico relied on assistants to paint the Guidalotti altarpiece, although no consensus exists in assigning specific passages or sections of the work to hands other than the master's. Comparison of the engraved and glazed feathers of the wings of the angels on either side of the Virgin's throne in the center panel makes clear that assistants were, indeed, employed — at least in a minor capacity — in carrying out the decorative details of this work; the feathers of the right-hand angel's wing are carefully individualized and brilliantly foreshortened along its "muscular" top ridge, while the feathers of the left-hand angel's wing are approximate, not entirely competent, imitations of them, merely filling in the form rather than modeling it. However, one assistant was allowed a freer, more independent hand elsewhere in the altarpiece in painting the figures of Saints Paul, Jerome, Stephen, and Lawrence in their entirety on the pilasters, as well as most of the central panel of the predella. (*12) This assistant clearly was Zanobi Strozzi,(*13) and the style of these passages is consistent with his work of the late 1430s. Documentation of the patronage of the Guidalotti chapel has not uncovered any more reliable clues to the date or circumstances of the commissioning of the altarpiece. Elisabetta Guidalotti provided for the endowment and, apparently, for the decoration of the chapel, in which she had erected a tomb monument to her brother Benedetto Guidalotti (d. 1429), the bishop, successively, of Valva and Sulmona, Teramo, and Recanati. (*14) Apparently, though, she was not the only member of the Guidalotti family to enjoy patronage rights to the chapel, or to have set aside funds for its embellishment: there exist notices relating to previous generations of Guidalotti, including a member of a collateral branch of the family, Francesco di Ugolino di Lippo Guidalotti, who left two hun-dred florins in his will of 1434 for the maintenance of the chapel. (*15) The fact that none of the many figures in the altarpiece makes overt allusion to Elisabetta Guidalotti as its patron, and that possible references to Benedetto Guidalotti are at best equivocal — Saint Benedict is among the twelve saints on the pilasters, but, as the father of Western monasticism, he is frequently depicted in major Dominican altarpieces — it is possible that the two did not exercise any direct control over the provision of liturgical furnishings for their chapel. The presence of the Guidalotti coat of arms on the altarpiece frame, recorded in early sources, implies only that they were called upon to finance its production but not that they were given authority to change the preexisting dedications of the chapel. Certainly, it is most unlikely that Elisabetta Guidalotti personally intervened through the extended Florentine family of her husband, Bartolomeo di Onofrio Bartolini, to engage the services of Fra Angelico, as has been suggested. (*16) It is far more plausible to assume that the artist was selected by the Perugian Dominicans themselves, and furthermore that his documented residence at San Domenico, Cortona, in 1438, may have been occasioned in part by the need to travel to Perugia to install the recently completed altarpiece there. (*1). The discreet areas of paint loss that affect the various panels comprising this altarpiece are documented in Fusetti and Virilli 1998, pp. 126-35, but the picture surface otherwise is remarkably free of abrasion. (*2). V. Garibaldi (1998, pp. 121-25) presents a detailed chronicle of the fate of most parts of this altarpiece from the seventeenth century onward. It had been removed from the Chapel of Saint Nicholas and separated from its predella by 1683 and possibly as early as 1614, when part of the vaulting of San Domenico collapsed. (*3). Fusetti and Virilli 1998, p. 130. (*4). Garibaldi 1998, pp. 121-23; Rossi 1876, pp. 326, 332, 349, and Rossi 1877, esp. pp. 11, 102, 104. (*5). Salmi 1958, p. 30. (*6). The iconography of the Annunciation of the birth of Christ, as opposed to the death of the Virgin, in which the angel bears a palm branch instead of a lily, is discussed in Braunfels 1949, p. xiii; Zucker 1975, pp. 193-95; Liebrich 1997, pp. 79-80. (*7). Longhi 1968, p. 44; Cole Ahl 1984, pp. 19-20; Bonsanti 1998, pp. 120-21; Briere 2002. (*8). Timoteo Bottonio, O.P (about 1578), Biblioteca Comunale di Perugia, ms. 1151 (no. 102), vol. B c. 42r (sub datum 1437): "La tavola de l'altar di San Nic.o ne la capella de Guidalotti fu data questo anno a dipignere a F. Giovanni da Fiesole Pre. S.mo et famosiss.o pittore de l'ord.e nro.," cited in Garibaldi 1998, p. 24. (*9). De Marchi 1985, pp. 53-57; Middeldorf 1955, pp. 188-89. (*10). Among the few recent scholars to dispute a later dating for the Guidalotti altarpiece, G. Bonsanti (2003, p. 49) adduces the evidence of Sano di Pietro's Gesuati altarpiece of 1444, which includes a figure of Saint Jerome that is a visual quotation of the depiction of Saint Nicholas reading, in Angelico's altarpiece. (*11). The first sacra conversazione planned by Angelico as a pala quadrata is the San Marco high altarpiece of 1440-42. The Annalena altarpiece, sometimes discussed as a work of 1434 or earlier, is later in date — certainly designed after 1440 and possibly as late as 1452-53 — and executed by Angelico's workshop. The Cortona polyptych, also occasionally discussed as a work of about 1430, is a loose replica of the Guidalotti altarpiece, its predella a reprise of that below the Louvre Coronation; it, too, is likely to have been painted in the 1440s, and is certainly a product of Angelico's studio. (*12). Five figures at the extreme left of the composition are by Angelico, but all the rest and the entire background are by another hand. Nowhere else does the altarpiece reveal significant intervention by anyone other than Angelico himself. (*13). The contention (Berti 1967, p. 9) that the center predella panel was painted by Giovanni di Consalvo is correct insofar as that name is understood to signify the author of the frescoes in the Orange Cloister at the Badia Fiorentina. It is argued below (pp. 291-93) that these frescoes are collaborative works, in large part by Zanobi Strozzi, some of them executed over sinopie drawn by Fra Angelico. (*14). Biganti 1998, pp. 503-19. (*16). Ibid., pp. 102-10; Strehlke 1999, pp. 477-79.